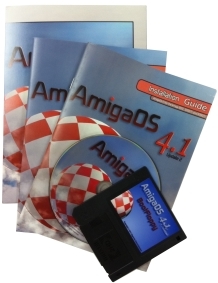 Hyperion Entertainment CVBA and AmigaKit are pleased to announce that AmigaOS4.1 Classic is now shipping! AmigaOS 4.1 Classic, the long awaited Classic Amiga system update is now available to purchase! It updates your Classic Amiga equipped with CyberStorm PPC or Blizzard PPC to the latest AmigaOS 4.1 (Update 2) standard and builds on the foundations of AmigaOS 4.0. This is the first major update for Classic Amigas for three years. 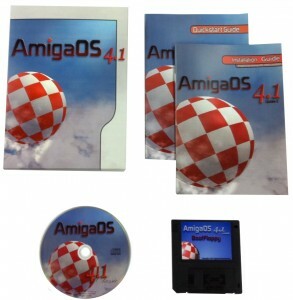 Supplied on Amiga CD with Boot Installation Floppy Disk, two printed manuals and box. In addition, a comprehensive AmigaOS 4.1 Classic FAQ and File System comparison chart is included on the CD in PDF format. *Note: Radeon graphics card support limited to Mediator PCI busboards only at present- this possibly will be extended to Prometheus PCI in future updates. This update is the result of many months of hard work to bring new life to Classic Amigas. Special thanks go to Carl Moppett, Darren Eveland, Steven Solie, Joerg Strohmayer, Thomas and Hans-Joerg Frieden, Martin Merz, ACube, Michael Boehmer (E3B), Tobias Seiler, Elbox, and the many AmigaOS 4 developers and beta testers and other contributors to this product. Hyperion and AmigaKit would also like to thank all Amiga Users for their continued support. Without you it would not have been possible. We hope that you enjoy using AmigaOS 4.1 Classic and look forward to the exciting updates that we have planned in the near future!